This Japanese Yakitori barbecue chicken recipe can be served either as an appetizer or as a healthy option served on a salad or in a pitta. It's packed full of flavour and it’s easy (just make up the barbecue sauce). You need to allow half an hour to prepare the Yakitori barbecue sauce so if you're going to use wooden skewers to cook, it's time to get them soaking now. 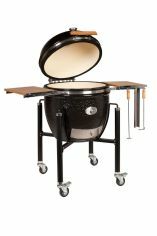 Strictly speaking there is is such a thing as a yakitori barbcue grill and we should be using one. It's a bit like a shoe box, the hot coals go in the bottom and then the meat with bamboo skewers are rolled across the top. Start with the raw meat skewer at one end, roll it along a little to turn the meat and then add another skewer to the end of the grill where the first one started out. Repeat this process and the meat cooks as the skewers roll across the yakitori grill and are fully cooked when they reach the other side. The perfect street food production line. Technically I should include a Japanese ingredient called Mirin which is a sweet wine for cooking so with a little extra sugar we can get away without it. Put a saucepan on a low heat and mix all the ingredients below with the exception of the chicken pieces. Stir until the sugar dissolves & leave to cool for half and hour. I prefer to use thigh meat in a barbecue chicken recipe because I think that it’s more succulent and has more flavour but breast works just as well. Dice up into one inch cubes or slightly smaller – one thigh or breast should do approx two skewers of six cubes. 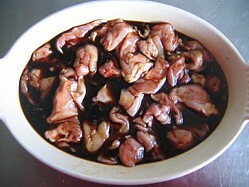 Throw the chicken pieces into the cooled marinade and give them a good coating for 30 minutes. Cut an onion up into chunks suitable for stabbing onto a skewer. Cut the onion in half and then into quarters. Take each quarter and rather than cutting into an eighth to create a wedge, cut the wedge on the diagonal so that when you separate the layers of onion you end up with triangles. 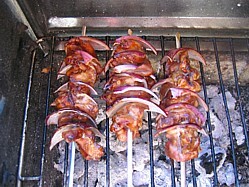 After that it’s a simple job of chicken, onion, chicken, onion etc onto the skewer. It's not just about adding vegetables to the kebab, placing a piece of onion in between each of the chicken pieces makes the chicken less dense so making it easier for the heat to penetrate the core of the meat and cook it more quickly. TIP 1 – I only ever use the first third of the skewer leaving me enough distance between my fingers and the BBQ! Try other vegetables as well as onion. Mushrooms and Peppers work well too. Slap your skewers onto the grill for 10 – 15 mins over medium hot coals turning regularly and brush on a little more of the marinade 2 or 3 times throughout the cooking process. Note:- The high sugar content of the marinade will make the meat susceptible to burning. For this reason it's best not to have the grill too hot. TIP 2 - If you reduce the sugar content of the sauce to 1 tablespoon we change the sauce from Yakitori to Teriyaki and this really works with BBQ Salmon. 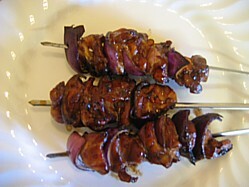 Check out my other Asian Style Barbecue Sauces that can make the same skewered chicken come from a completely different part of the continent. Or if it’s the healthy option you want click here for Low Carb Barbecue Sauce.